Villa Kawan is located in the southwest corner of the island of Bali at 50 minutes from Ngurah Rai, Bali Airport and 6 miles from the famous Tanah Lot Temple. Villa Kawan is the perfect place for a quiet and relaxing holiday. 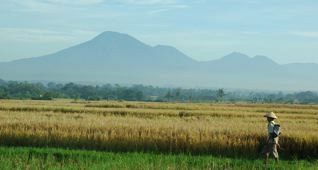 Surrounded by rice fields and only 5 minutes from the Indian Ocean, with the contours of the volcano Batukaru in the background. Villa Kawan represents the quiet original 'Rural Bali’. 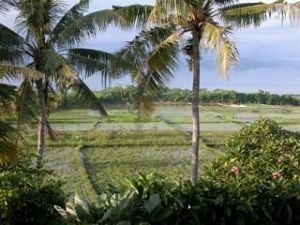 The murmur of the ocean, the silence of the countryside, it is the ultimate place for those seeking the authentic Bali. At a mere 5-minute walk from the beach and with plenty of hiking and biking opportunities in the immediate vicinity, you will be surrounded by quiet, space and nature. »DISCOVER IF YOUR DESIRED DATE IS STILL AVAILABLE! You can reach Ubud within one hour by car or motorbike. This beautiful and fascinating town has been Bali’s center of art, dance and music for over a century. In Ubud you can go to various dance and music performances, Neka Art Museum (including Walter Spies) and there are many shops with clothes, jewelry and art. There is also a colorful bazaar (daily) and an infinite variety of large and small restaurants. Ubud offers many possibilities for spa and massage. Really a wonderful place to be pampered. Bali is the island of 1000 temples. The most famous temple of Bali. Especially at sunset, the temple makes for a magnificent spectacle. This temple is within hiking distance from Villa Kawan. It is a 5-mile walk, with the option to take a taxi home at Tanah Lot temple, it also makes for a beautiful biking trip. Not only temples but also sources and basins of holy water in which swimming is allowed. Pura Bratan is located on the shores of Lake Bratan in the mountains near Bedugul and is dedicated to the gods of lakes and rivers. While there do not forget to visit the market in Bedugul. Goa Lawah is located on the east coast of the island near Candi Dasa. Visiting this temple can easily be combined with a visit to Tenganan, an authentic Balinese village. In Bali, there are several possibilities for rafting. From very adventurous and wild to simple and extremely safe. It's a wonderful way to experience the rivers and the vegetation on the steep banks. Rafting is possible in the Ayung River near Ubud and the Telagawaja River in the Karangasem district. Swimming with dolphins is possible on the northern coast of Bali. At Lovina Beach a guide can take you out at sea for early morning dolphin watching. 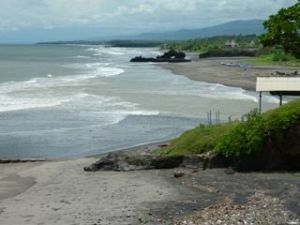 The beaches of northern Bali are beautiful and the sea is much calmer here. This is also a unique place for snorkeling. Bali has two of the most famous golf resorts in Asia, Bali Handara Kosaido Country Club and, close to Villa Kawan, Nirwana Bali Golf Club. Both of course 18 holes in a stunning surrounding and both with mostly pleasant temperatures. Handara because its high location, Nirwana because it has a location direct next to the sea . Nirwana has beautiful views on Tanah Lot (see www.nirwanabaligolf.com). In Villa Kawan one golfset is available for a long person (about 1,9 m). For playing golf in Nirwana after 4 hr (sunset) a reduced fee is available.